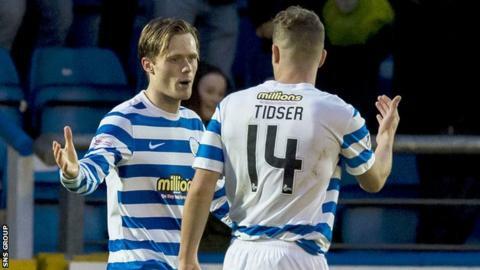 Denny Johnstone scored a brace as Morton beat Queen of the South to move up to fourth in the Championship. The hosts had a number of chances to take the lead in the first-half but could not find a way past visiting goalkeeper Robbie Thomson. The Ton finally made the breakthrough after the break when Johnstone found the top corner from 20 yards. And Johnstone doubled his side's advantage when he got on the end of Ross Forbes' corner to nod home. Match ends, Morton 2, Queen of the South 0. Second Half ends, Morton 2, Queen of the South 0. Attempt blocked. Mark Millar (Queen of the South) right footed shot from outside the box is blocked. Attempt blocked. Alex Harris (Queen of the South) left footed shot from the left side of the box is blocked. Bobby Barr (Morton) is shown the yellow card. Attempt blocked. Ross Forbes (Morton) left footed shot from outside the box is blocked. Attempt missed. Joe McKee (Morton) right footed shot from outside the box is high and wide to the right from a direct free kick. Alex Samuel (Morton) wins a free kick in the defensive half. Substitution, Morton. Alex Samuel replaces Stefan McCluskey. Attempt missed. Luca Gasparotto (Morton) header from the centre of the box is just a bit too high. Corner, Morton. Conceded by Darren Brownlie. Attempt blocked. Bobby Barr (Morton) right footed shot from the left side of the box is blocked. Attempt saved. Mark Millar (Queen of the South) right footed shot from long range on the left is saved in the top right corner. Jordan Marshall (Queen of the South) wins a free kick on the left wing. Attempt blocked. Ross Forbes (Morton) right footed shot from outside the box is blocked. Thomas O'Ware (Morton) wins a free kick on the right wing. Attempt missed. Mark Millar (Queen of the South) left footed shot from outside the box is too high. Attempt missed. Iain Russell (Queen of the South) right footed shot from long range on the left is high and wide to the right. Attempt saved. Bobby Barr (Morton) right footed shot from the right side of the box is saved in the bottom left corner. Substitution, Queen of the South. Alex Harris replaces Gary Oliver. Substitution, Queen of the South. Liam Coogans replaces Paul Heffernan. Attempt blocked. Denny Johnstone (Morton) right footed shot from outside the box is blocked. Lewis Kidd (Queen of the South) wins a free kick on the left wing. Attempt missed. Denny Johnstone (Morton) header from the centre of the box is close, but misses to the right. Substitution, Queen of the South. Iain Russell replaces Ryan Conroy. Corner, Morton. Conceded by Chris Higgins. Attempt blocked. Thomas O'Ware (Morton) right footed shot from the centre of the box is blocked.